Compact and nimble, this Polaris ATV redefines what a great ride is. 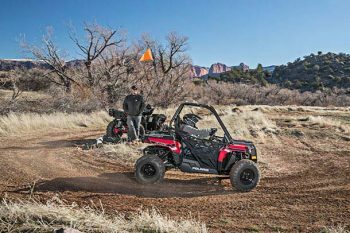 Known for its wild performance and fast, aggressive driving, the Polaris Ace is often bought in pairs for families that want to be on the trail together, but define their own riding experience. Ready to introduce the next generation of young riders to the thrills and skills of solo riding? Then the Ace 150 should be your choice. It is the only single seat youth ATV with a full cab frame. .The 150 lets you match the skill of your riders with parent adjustable speed limiting. Speeds can be set from as low as 10 MPH, and max out at 29 MPH. The electronic fuel injected 149 cc engine offers consistent starting, improved idle quality, and crisp throttle response. An electric start and automotive style controls make it easy for youngsters to hit the trail. Long-travel front and and rear suspension soak up the bumps. The full 9 inches of ground clearance allow for more off-road ability. The Ace 150 comes with 1 youth helmet, LED daytime running lights, seat belt, and a safety whip flag as standard equipment. And this one is for the big boys and girls. 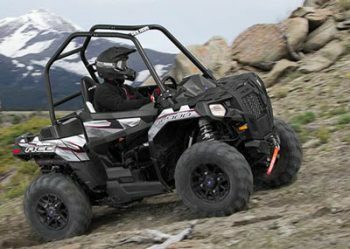 Packed with premium performance features, this Polaris ATV takes on the trails with a vengeance. The single seat puts you directly in the center of the trail and the center of the excitement. And it does it with comfort in mind. There's plenty of leg room, easy entry/exit, and a gallon of cockpit storage space. You'll welcome the convenience of the all new digital instrumentation with Bluetooth capability. You'll ride smooth on the long travel front and rear suspension and Walker Evans compression adjustable needle shocks. And you'll travel fast, with a 78 HP ProStar 900 ERI engine. Electronic throttle control, dual overhead cams, 4 valves per cylinder and electronic fuel injection move you with power and instant, predictable throttle response.